Several of the Heat's key veteran players are supportive of the signing of Beasley, and he has a strong interest in returning to the franchise responsible for taking him with the second overall pick in the 2008 NBA draft, sources told Yahoo. 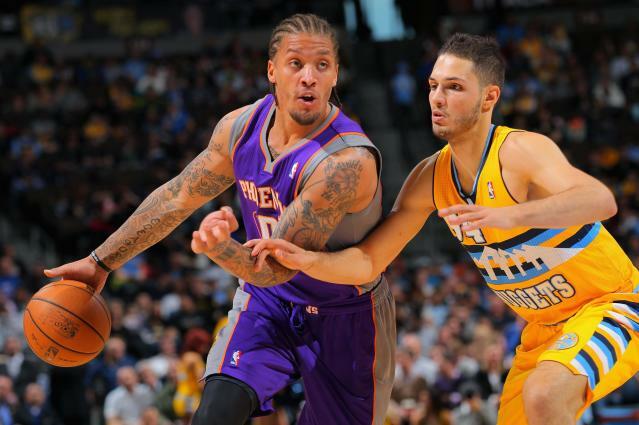 The Phoenix Suns reached a buyout agreement with Beasley on the remaining two years of his contract last week. Beasley, 24, was charged for marijuana possession in an August arrest, adding to his considerable history of issues surrounding pot. Beasley left Phoenix with approximately $7 million of the $9 million owed him on an original three-year, $18 million contract. Beasley, a 6-foot-10 forward, played two seasons for Miami before president Pat Riley traded him to the Timberwolves in 2010 for draft picks and the salary cap space needed to make the Heat's historic haul of LeBron James and Chris Bosh. Beasley had two productive seasons with the Heat, averaging 14.1 points in less than 30 minutes a game. Beasley averaged a career-best 19.2 points for the T'wolves in 2010-11. He struggled in the first season of a three-year deal with the Suns, shooting 40.5 percent and averaging 10.1 points. Nevertheless, Beasley's ability to score makes him an intriguing low-cost, reclamation project for a franchise like Miami with strong leadership and structure throughout the organization. Miami lost perimeter scoring threat Mike Miller with the amnestying of his contract to save money this summer, and signed free-agent center Greg Oden to try to resurrect his career.